Download the program for this event here. Content: Based on the focus outlined below, this will be a two-day group workshop with a core curriculum delivered by Dr. Wes Habley and Credo facilitators, to include small-group breakout time and interactive project work. 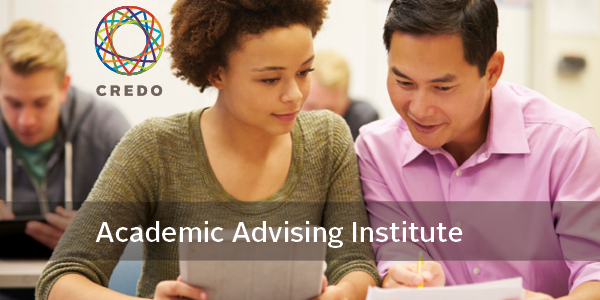 Join Credo and renowned advising expert Dr. Wes Habley for this interactive two-day institute exploring how to incorporate academic advising into a comprehensive model for career/life planning. Thank you for providing me with the opportunity to attend the Credo Advising Institute. It was an extraordinary experience. I had the opportunity to collaborate with fellow advisors from multiple institutions, all under the guidance of the professionals at Credo. The feedback and support was incredible. I’ve returned from this conference not only with new ideas for developing our advising program, but also with renewed energy to do so. The 2015 Credo Advising Institute (CAI) is pleased to welcome Dr. Wes Habley, founding board member of the National Academic Advising Association (NACADA), as our lead facilitator. The purpose of this year’s CAI is to explore how to incorporate academic advising into a comprehensive model for career/life planning, learning where and how to incorporate developmental stages into your current advising model for maximum student success. Many advising programs are based on the assumption that students have made reasoned decisions regarding their choices of a major. As a result, advising is viewed as the selection and scheduling of courses. In reality, selecting and scheduling courses should be the end result of a comprehensive student success model that incorporates academic advising. This model includes the critical elements of self-awareness, exploration of the world of work, and identifying personal direction that leads to clear life and career goals. These tasks serve as a scaffold for identifying and planning an individualized set of educational experiences: major, minor, electives, co-curricular involvement, service learning, internships, independent study, and study abroad. Regardless of whether your institution utilizes a shared, decentralized, or centralized structure, your advising can and should incorporate these critical stages of student development through the advising experience. Have an improved understanding of O’Banion’s model of academic advising and its explication. Be able to identify ways in which this model is operationalized in a variety of advising structures. Identify services in the career/life planning models that are currently provided by academic advisors. Identify where services supporting the career/life-planning model are currently provided by other units on campus. Articulate strategic steps for initial or further integration of these stages into their existing structure. Increase experiences with integration of services (academic advising and career development) for improved effectiveness and efficiencies. Dr. Habley held numerous positions at ACT, Inc. and recently retired from ACT as Assistant Vice President for Strategic Partnerships. Upon his retirement, Habley was honored to receive ACT’s first Lifetime Achievement Award. He currently serves as a Senior Consultant to ACT, Inc. on College Student Success and also with Thomas Brown Associates. Habley is a founding board member, past president and past treasurer of the National Academic Advising Association (NACADA). In 1987, he inaugurated the Summer Institute on Academic Advising and served as its director for 22 years. In 2006, Habley was named Director Emeritus and in 2007 the Summer Institute Scholarship was named in his honor. He is the recipient of NACADA’s awards for Outstanding Contributions to the Field of Academic Advising and Service to NACADA. Habley is lead author of Increasing Persistence: Research –based Strategies for College Student Success (2012). He is co-editor of the first (2000) and second editions (2008) of Academic Advising: a comprehensive handbook. Habley served as lead researcher on ACT’s 2004 and 2010 national retention studies published as What Works in Student Retention? In addition, Habley is the editor of the monograph on ACT’s third, and author of monographs on ACT’s fourth, fifth and sixth National Surveys of Academic Advising. Finally, he contributed chapters to Fostering Student Success, Developmental Academic Advising and Faculty Advising Examined. Additional published material has appeared in the NACADA Journal, The Journal of College Student Personnel, NASPA Journal, NACADA Monograph Series, the Jossey-Bass New Directions Series, and several monographs published by the First Year Experience Program at the University of South Carolina. Habley earned his BS in music education and M.Ed. in student personnel from the University of Illinois-Urbana/Champaign and his Ed.D from Illinois State University in educational administration where he was recently inducted into the College of Education Hall of Fame. Prior to joining ACT, Habley served first as an academic advisor and later as the Director of the Academic Advisement Center at Illinois State. Habley also served as the Director of Academic and Career Advising at the University of Wisconsin-Eau Claire. Habley will join Dr. Joretta Nelson, Credo's Senior Vice President, and Dr. Bryant Hutson, Credo's Director of Research (and Co-founder of Appreciative Advising) for this special event, along with a number of skilled and experienced advising leaders as small-group facilitators.